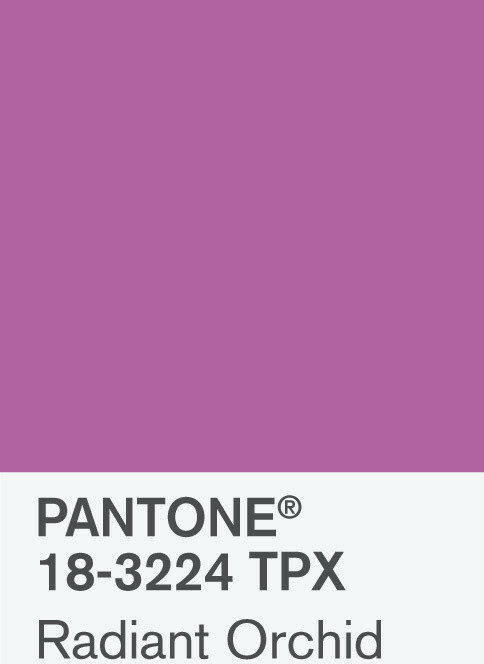 You’ve probably heard the buzz surrounding the Pantone Color Institute’s decision to select Radiant Orchid as their 2014 Color of the Year. Shortly after the news broke, stores and designers kicked marketing of all things in fuscia and purple into overdrive. It’s easy to stay on trend by using plants, accents, throw pillows and even a splash of paint because all can be replaced or supplemented, in the event you grow tired of Radiant Orchid. Radiant Orchid reenergizes almost any color palette but especially complements olive and deeper hunter greens — which means it’s perfect for outdoor use. Pair it with turquoise, teal and even light yellows or use it to accent neutral colors like gray and beige. We we’ll give you a little background as to why Color of the Year is a big deal and examples of how homeowners are integrating shades of Radiant Orchid outside. Basically, Pantone Color Institute® is the world-renowned authority on color. They are responsible for creating an innovative system for identifying, matching and communicating colors which revolutionized color-critical industries such as digital technology, fashion, home, plastics, architecture and contract interiors, and paint. The Pantone Color Institute chooses a color based on extensive research into what people around the world are currently in search of. The color addresses this need, however, there is no better explanation than this one. It’s the combination of purple and pink undertones that cause Radiant Orchid to be such a flexible color to use around the home. Color of the Year is announced at the end of the prior year, giving some designers time to incorporate Radiant Orchid into spring and future 2014 designs. If pretty isn’t enough of a reason to consider Radiant Orchid, purple is known to soothe the soul. It’s so zen that apparently it has been used as a visual anesthesia during minor surgeries. 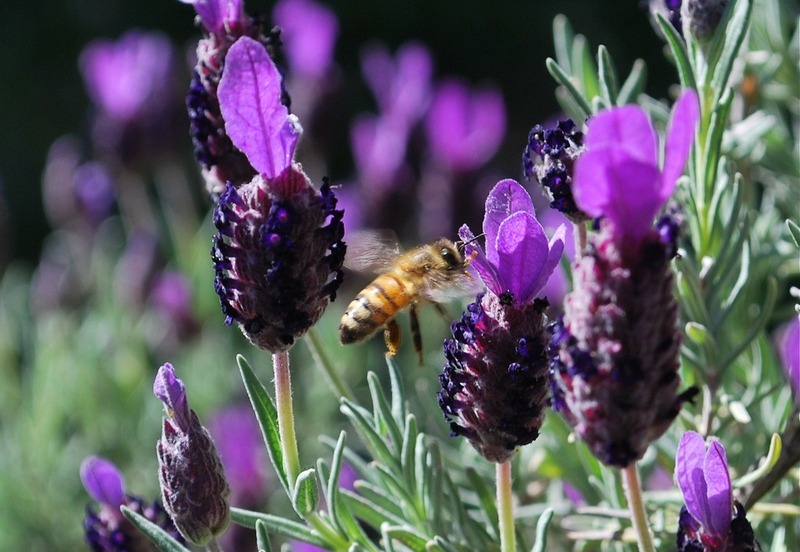 Purple also creates a sense of overall mental and metabolic balance–some experts believe that it can actually suppress hunger. Radiant Orchid draws inspiration from the beautiful Phaleonopsis or Moth Orchid (pictured at the top), which are usually grown indoors. If using a Moth Orchid as a temporary accent on a patio table, for example, place it away from direct sunlight. 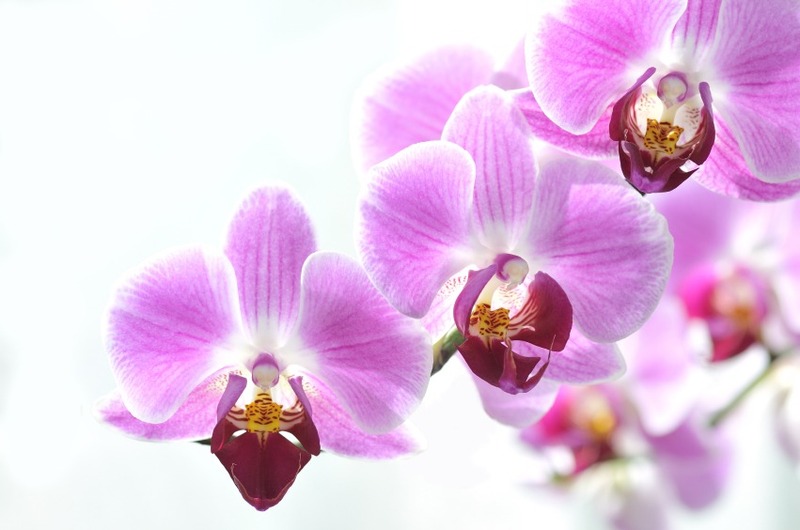 The Moth Orchid displays beautiful fuscia, purple and pink undertones. Some cymbidium orchids share these colors, too, and can be grown in containers on the patio. Those of you who were forward-thinking enough to plant these bulbs in the fall will be rewarded as they bloom in the spring and summer. 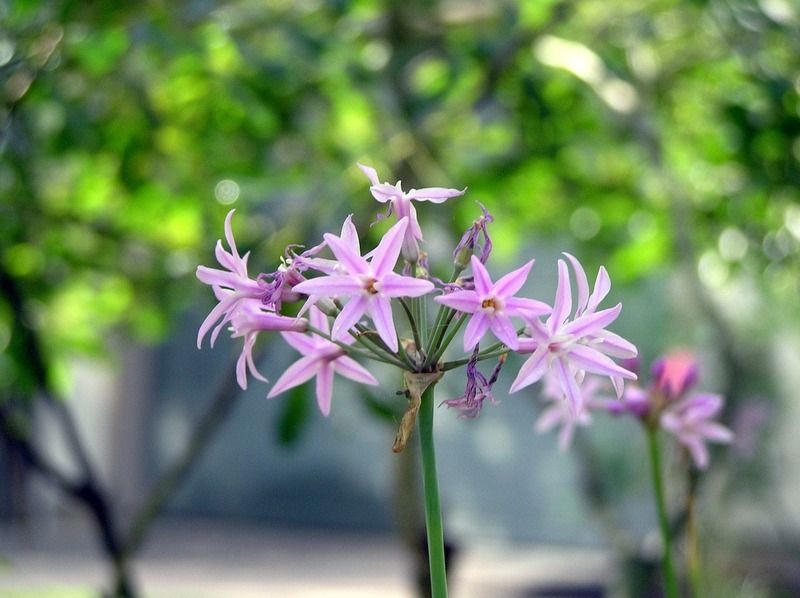 Alliums are actually ornamental onions and they do grow well in San Diego when planted well-drained soil. This means if you have clay soil, you’ll need to dig a sizable hole the soil around the bulb. 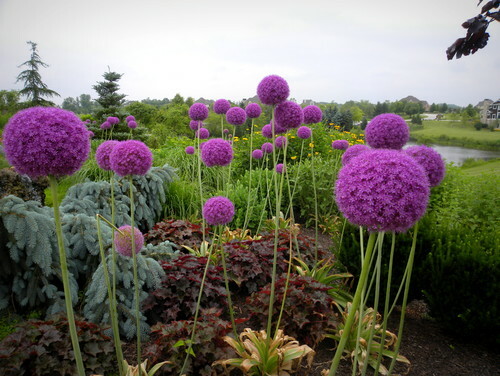 Depending on the variety you choose, alliums can grow up to 4′ tall with blooms almost 1′ wide. In San Diego, these pretty little flowers bloom from roughly March to September. And, the bonus is that you don’t have to do any deadheading after the flowers die. 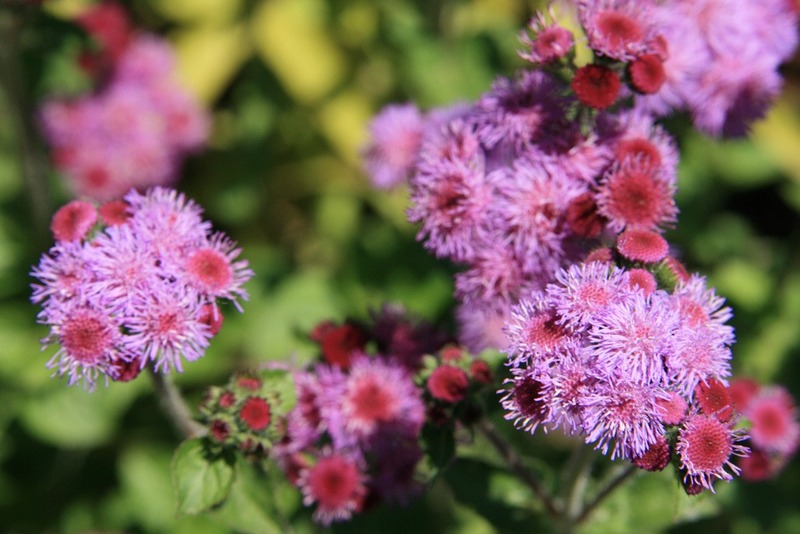 They come in a variety of blues, pinks and purples and look cute in small cut arrangements. This water-wise plant features a richer shade of purple than the standard blue-grey lavenders. It needs only occasional watering after becoming established. Butterflies and birds love it. The blooms start roughly in mid-spring and last throughout the summer. Local nurseries do carry plenty of lavender, though you may need to special order this one. 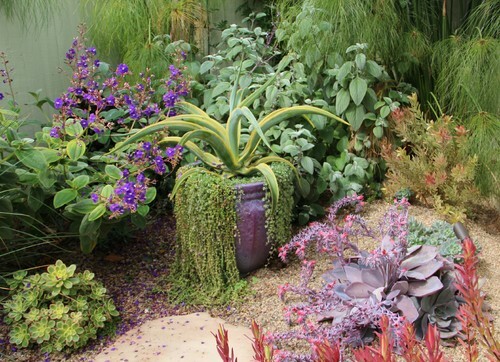 Find both very easily and inexpensively in San Diego from Home Depot to your local nursery. 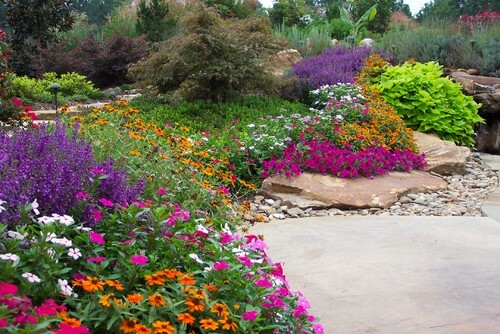 And, don’t be afraid to mix them with other colors as pictured above. Petunias (fuscia colored, on top of the rock) and impatiens (white and fuscia in left corner) come in a variety of colors and look stunning in containers. An excellent groundcover choice for Southern California, some creeping thymes have little lavender flowers. Sold in flats, it’s also an inexpensive, relatively low maintenance and water-wise choice. 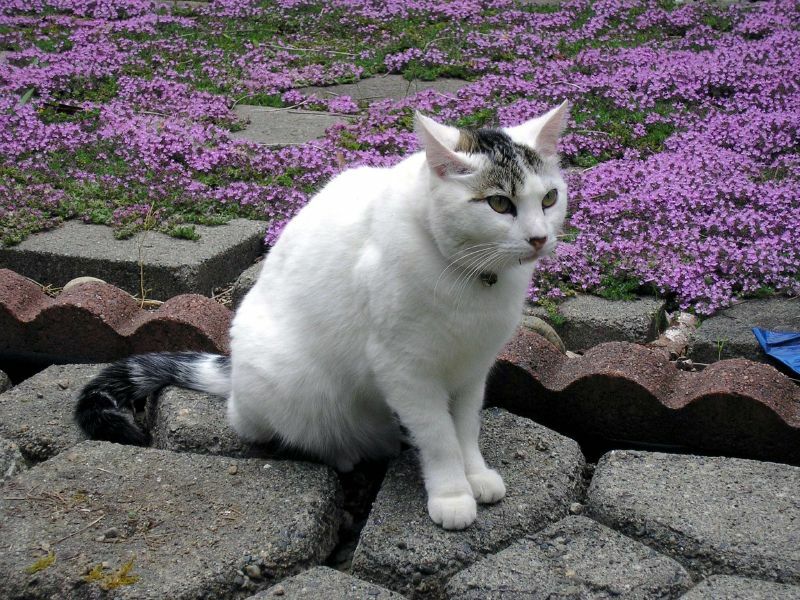 Creeping thyme plants also provide a hint of fragrance, too. In San Diego society garlic grows well with neglect in poor soil conditions. The variegated type has pretty silver-green striped leaves with flowers growing up to about 2′ tall. Find it at Home Depot. The Pantone Color Institute suggests integrating Radiant Orchid with other bright colors. The amazing sofa area above does just that, using the palatte they suggest. Sunbrella has a number of outdoor fabrics that are pretty darn close to radiant orchid. In San Diego, places like Discount Fabrics on Morena Blvd have a wide range Sunbrella books to flip through and can custom-make pillows of any size at a surprisingly reasonable price. Remember, we’ve already discussed how to clean outdoor pillows and furniture. The visual interest that small areas painted in hues similar to Radiant Orchid is undeniable. The flax plants do an excellent job of drawing the tones into the landscape. Or, how about this trellis? 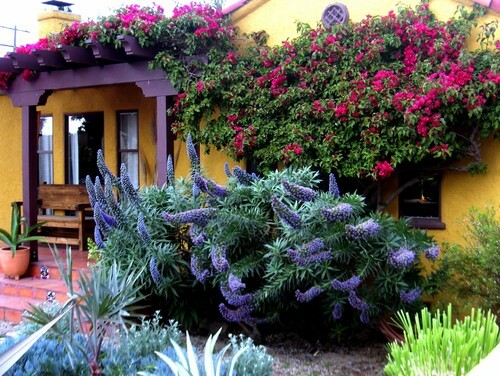 Between the succulents, container and flowers, this scene screams Radiant Orchid. In San Diego, check a huge warehouse like Canyon Pottery that carries ceramic planters in pretty much every color and at a discount. Though a larger commitment, this homeowner went with purple chairs, wicker tables and floor pillows. How much attention do you pay to the Color of the Year? 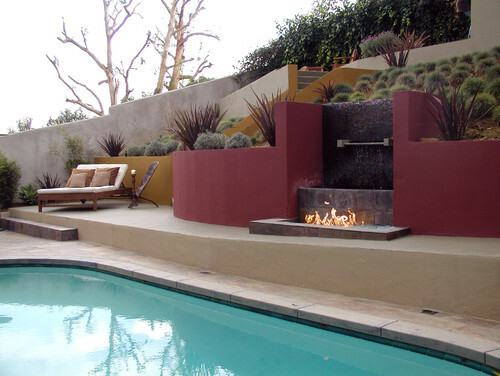 Will you integrate Radiant Orchid into your home?